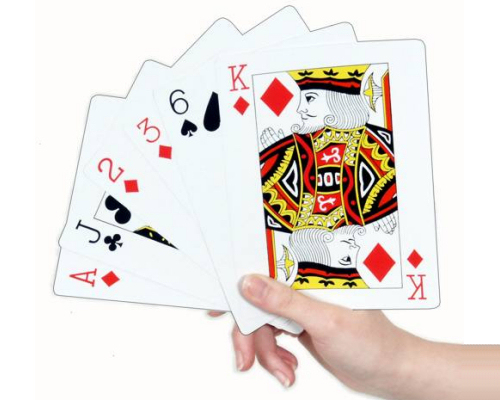 Beyond their entertainment factor, the deck of cards has also played an important role in our history. During World War II, a U.S. playing card company secretly worked with the U. S. government ro make special decks to send as gifts to American prisoners of war. When these cards were moistened, they could be peeled apart to reveal sections of a map indicating escape routes. Imagine! The very cards we used to play Go Fish have also saved lives! It is easy to see why we should preserve this American icon. I am intrigued by the web site and its products, but what really caught my attention was the tagline. The tagline emphasizes that it isn’t enough to just accept a challenge we have been dealt. The tagline encourages us to face the challenge, understand it, meet it head on, and talk about it. I think “wear it” in the tagline is telling us to show it, share it, and educate others. We are faced with many challenges in our lives. My friend has been diagnosed with Parkinson’s Disease, a progressive disease that can make doing ordinary things difficult. Initially he discounted the diagnosis, pretending it wasn’t there. However, like most challenges, at some point we can no longer pretend it isn’t happening and he came to grips with it. He did not give in to the disease, but he began asking more questions and researching the disease. By attending support group meetings, he is learning to live well with the unwelcome disease by sharing his experience with others and learning from them as well. Women impacted by breast cancer definitely wear the hand they are dealt as they display the pink ribbon-logo on their clothing and personal belongings. My mother was diagnosed with breast cancer in the 80’s and never told a soul, not even her children. My mother did not survive. Today, most woman dealt the breast cancer hand wear it, get the treatment needed and join the very visible walks and fund-raisers educating others around them. Many hands we are dealt are positive ones, such as a job promotion, or opportunity to contribute to a community project. We need to “wear” those too. In our world where we can communicate in so many different ways, my favorite mode of communication remains talking with others and sharing real life stories ….”wearing” the hand we were dealt. High SUCCESSTROGEN women tell their stories as a way of educating others, and they listen intently to the stories of others as well. And what about you? Do you wear the hand you are dealt???????? Loved your Whole Foods story!! Both you and the cashier gained from your exchange of ideas / concepts! I was walking my dog and I stumbled across this playing card. I had a recent post about how playing cards have meanings derived from the Tarot tradition, and so I tend to get messages from “angels” by finding playing cards on the ground…so this one made me laugh out loud. It is the card that reads “Don’t just PLAY the hand you’re dealt….WEAR it. I think it is probably a 55th card, so it may not be a joker, but if it is, then it is “The Fool” in the Tarot tradition. Still, I was glad that your interpretation of the statement was the same as mine. I have been dealt a somewhat gnarly hand, but I have been playing it well. Despite an early onset of mental illness at age 19, I have managed my condition very well. I got through undergrad and graduate school, earning my MBA. Although I had tried to treat this illness with illegal drugs and alcohol, I stopped and got back on course at a young age (22). I am proud of my life course, even if I face discouragement and occasional depression while I trudge the road. It has given me a lot of strength to draw on when things are tough. The card was clear. I need to advertise my strengths in whatever way I can. Today I sent my boss a couple of emails reminding him how many millions I helped save the company. I also reached out to the CEO to ask for our mission, vision and values (which aren’t currently published anywhere) and also offered to help write them up if he didn’t have them available. I am wearing the hand of strengths for sure. As for the difficult hand: in May, I wished everyone a “Happy Mental Illness Awareness Month” in my status bar on the company instant messaging app. Why hide it? I have a few difficult days here and there, but for the most part, I’m a pretty good person to work with. In my experience, not many people are willing to stand up for the mentally ill, and especially not the people suffering, who have a lot of shame and fear about being found out. It takes brave people to stand up and announce it, trusting in the protection and care of a higher power to see us through any eventual upheaval. So far, nothing bad has happened.